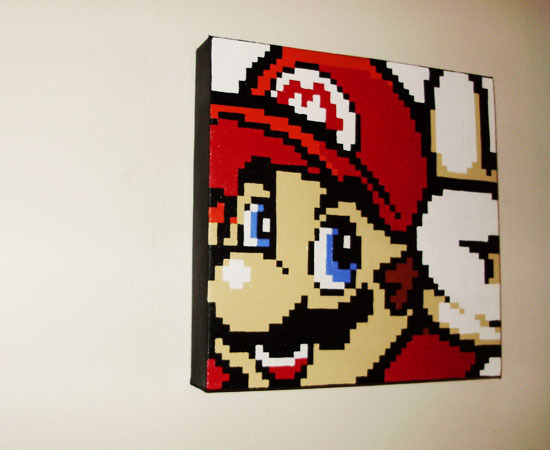 The Gay Gamer: You really can't have too much Mario-inspired art, can you? You really can't have too much Mario-inspired art, can you? Does the headline above--or, rather, the fact that just a few words of it flow into the second line--drive any of you nuts? Honestly, it drives me nuts, but I'm too lazy right now to rewrite it in a way that will be less annoying. Anyway, who cares about that, right? We're hear to talk about Mario-inspired art! Specifically, we're here to talk about the Mario-inspired art seen in the photo below (and here). Oh, and the Mario sprite that's front and center on this canvas was pulled from Super Mario Bros. Deluxe, a GameBoy Color title released in 2000. To see more of this talented artist's stuff, check out melonjaywalk.blogspot.com. That's awesome. It inspires me to do something similar. Hmm. Frank: Ah, if it inspires you, that's great! As for the bothersome header: Sorry. I should know better than to leave "widdows" when I write headlines, but sometimes I can't help myself. It is, after all, just a blog, right? Thanks everybody! Bryan, you spoil me with all this attention! Yeah this one came out quite well, though.. A friend of mine says he prefers it when I collage and customize and put misleading text on my paintings. Me too. I would do more but.. I do gifts so often. And people want simpler compositions like this. It's okay too, I guess. What do you think? Also, playful editorializing yeah man! As much as I love this piece, I have to agree with your friend: I prefer it when you collage and put text over your paintings. It adds depth to the aesthetic, in my opinion. That said, your simpler compositions are great, too. I especially like the crop you did on this one. Keeps it from being your typical Mario headshot, you know?